In this edition of Pounding Pavement, we review the first Wake Forest Food Truck Rodeo. 15 miles north of Raleigh is a community steeped in southern pride and charm, a community rich with heritage and societal tolerance, the Town of Wake Forest. 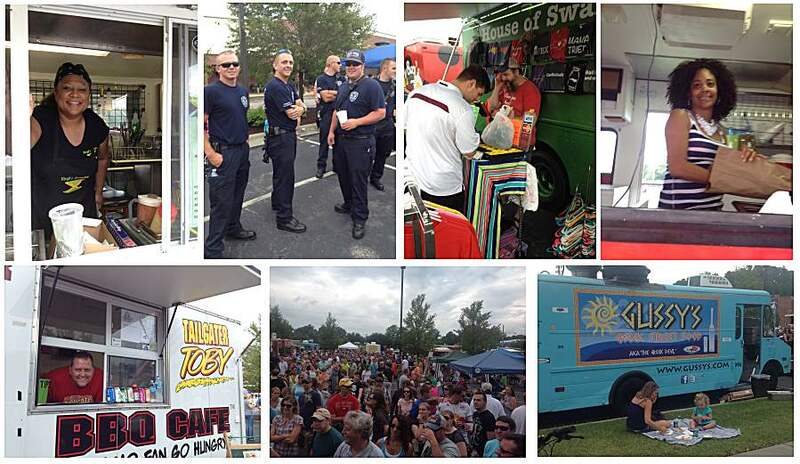 This community recently hosted its first Food Truck Rodeo to an overwhelming success. The event was held at the Renaissance Center, 419 South Brooks St. The location, a mall parking lot that has a bowling alley and classic car dealership, gave ample room needed to facilitate the event. The occasion was largely the effort of food truck vender, Virgil and Taffy Wilson, of Virgil’s Jamaica. The Belle and I arrived early. The traveler was not able to attend due to a previous engagement. It had been raining since about 10 am, but we were certain that the skies would clear, and the afternoon would be dryer. We were not disappointed. As was usual, we had arrived about 30 minutes early, and took the opportunity to network and decide a plan-of-action; whose food were we going to try and who was going to get our choices. We found the food extraordinarily diverse in both taste and ethnicity; a plus for any event whose foundation is food. Within 30 minutes, much to our astonishment, a crowd had swelled to fill nearly all of the allotted area encircling the venue. Lines were forming at all the food trucks, and people seemed to be enjoying the cooler than forecasted afternoon. My mind had started to refrain a line from a popular movie that declared, “If you build it, they will come.” Certainly, this event’s attendance will have to be used as the benchmark upon which all other events in Wake Forest will be measured a success. Because Virgil Wilson was instrumental in making this event possible, it was only fair we sample selections from Virgil’s Jamaica. Our other selections included pizza from Pie Pushers, Tailgater Toby’s BBQ, and Turtle Brownies, sweet treat from Lady Bug’s Treats (a twitted recommendation from Not Just Icing and The Wandering Sheppard). Having grown up in a region of the US, where the Caribbean was my backyard, I am no stranger to ‘Jamaican jerk’ and it enticing flavor of spices. We sampled Virgil’s jerk chicken with dirty-rice and plantains, another food that I am familiar with. I found the jerk flavor liking to my pallet. An excellent rendition of jerk seasoning I remember so fondly from my youth. I also sampled a meat pie, which I am also familiar with and I found this fare genuinely Jamaican, and to my liking as well. No self-respecting food rodeo in the Triangle would be complete without at least one vender serving BBQ. It was up to Tailgater Toby to carry the BBQ ball! 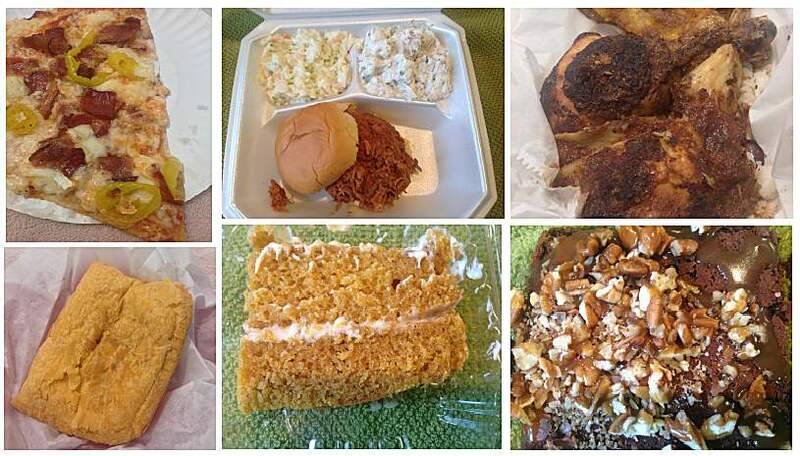 The Belle selected a BBQ pork sandwich, which came with two sides; coleslaw and potato salad. This sample was very good and hearty as well. We both agreed that the red potato salad was above average. To satisfy our sweet tooth later in the evening, we each got a different sampling from Lady Bug’s Treats. Belle selected the Turtle Brownies, while I chose the Carrot Cake. We found both selections excellent and satisfying. We not only left the rodeo with our evening desserts but also Tee shirts from the House of Swank.